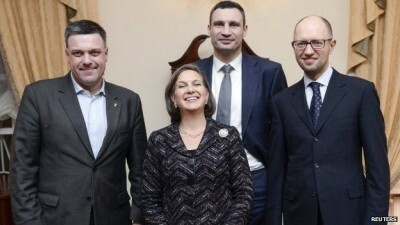 For her part, Nuland passed out cookies to anti-Yanukovych demonstrators at the Maidan square, reminded Ukrainian business leaders that the U.S. had invested $5 billion in their “European aspirations,” declared “f**k the EU” for its less aggressive approach, and discussed with U.S. Ambassador Geoffrey Pyatt who the new leaders of Ukraine should be. “Yats is the guy,” she said, referring to Arseniy Yatsenyuk.